LOOK YOUR WORST! TURN BLUE! THE [VIENNAGRAM:] RETURNS to the Belly of the Whale! hosted by TV's 'Shilling Shockers': PENNY DREADFUL! EVIL SPIRITS! STRANGE ACTS! DANCE MACABRE! MONSTER MOVIES! TONS OF BLOOD! NO SURVIVORS! NOTE:[GHOULS OF ALL AGES] Due to limited capacity, the first 20 mortals to arrive shall receive a Mystery Trick-or-Treat bag assembled by the vile A.V. VIENNA himself! 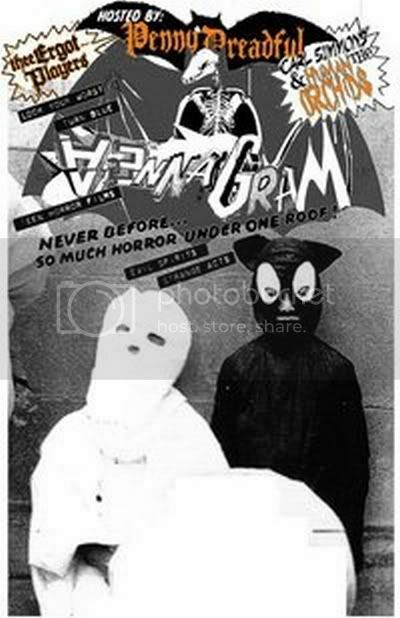 Not to mention tons of new [VIENNAGRAM:] Merchandise from IRRATIONAL SOLUTIONS inc.